Show me the money, Mr Jackson! An article was published today on Stuff which explains how Mortal Engines film production qualifies for a bit of a hand out from the NZ government. 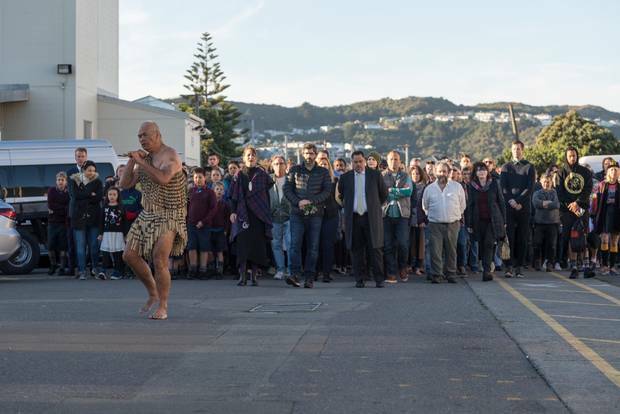 NZ gives a hand out to attract film productions to take advantage of the economic benefits. It seems odd that ME gets it given Peter Jackson is going to only ever work in NZ as the production money is coming anyway. There was a bit of a stoush over the production of The Hobbit and the status of contractors being classed as employees a few years ago and the American companies threatened to take it away from NZ and they simply outplayed the Government. NE ways that's just some local history, the reason we mention the article is that it featured a great picture of Christian Rivers and Peter Jackson and producer Fran Walsh appearing to be at the start of a ceremonial welcome for the movie. They look to be in Mirimar, Wellington so I'm going to suggest this is Stone Street where the film was shot. Robert Sheehan Fan Club site, The Sheehab has managed to score an interview with the writer of Mortal Engines, the fantastic Mr Philip Reeve. This interview gives two insights - some of the behind the scenes stuff for the movie (though minimal) but it also highlights the warmth and sincerity that is a clear part of Mr Reeve. I'd love to have a cup of tea with him! Here's some key parts from the interview which relate to the movie and Reeve's thoughts. Which are you most looking forward to seeing on the big screen? I was shown some of the concept art a while back, and there’s all sorts of stuff I can’t wait to see. Apart from the huge things, like the cities and the Shield wall, I’m looking forward to seeing what the airship Jenny Haniver looks like - it becomes the nearest thing the main characters have to a home once their adventures begin, so I spent a lot of time aboard it in my imagination. Will Tom’s age be advanced for the film to match Robert’s or will Robert will be made to look younger, closer to Tom’s? You mustn’t take anything I say about the movie as gospel truth, because I’m not directly involved with it, but I think movie-Tom will be older than book-Tom. That’s fine by me, because when I first wrote Mortal Engines, Tom was in his early twenties, and I only made him a teenager when I realised I could publish it as a children’s book. It actually makes very little difference to the character, because London is a rather old-fashioned society where young men have to do as they’re told and respect their elders and betters. Did you ever imagine a dream cast and are you pleased with the casting choices? I sometimes toyed with a fantasy cast while I was writing, but that was so long ago that most of the actors I had in mind have grown too old or even died by now! But I think one of the things that Peter Jackson and his team are really good at is casting - the Lord of the Rings movies are full of actors who I’d never have thought of putting in those roles, but who turn out to be just right - so I’m confident they’ll find the right people. I’m very pleased with all the actors who’ve been announced so far, and looking forward to learning who else will be involved. What was your first reaction when you knew that your book would be produced by Peter Jackson? It was unbelievable, really. And then nothing happened for years and years, so I had to assume that it wasn’t going ahead, and I sort of forgot about it and got busy doing other things. Then about a year ago I heard the movie was finally going into production, and people in New Zealand were going to be busy building all these things I’d dreamed up twenty years ago. It still feels quite unreal. I won’t fully believe it until I can see it at the cinema, and perhaps not even then. We love that because Jackson option the novels so long ago that Reeves kind of just moved on and then one day boom! the movie is in production, indeed now in post. Image by the talented Rebecca Wright. For some, Stanley Kubrick's 2001 A Space Odyssey is one of the greatest science fiction moments in history*. For others, it's when the first Mortal Engines novel was published by Phillip Reeve which means some keen readers have been waiting some 17 years in a wishful kind of hope for a movie to be made. And now, first teaser trailer of the Mortal Engines movie has been leaked. We had Peter Jackson release concept art, production team photos and the odd official Philip Reeve set visit. But. Now. Here. It. Is. Christian Rivers is clearly hitting this one out of the Hunting Grounds! First of all let's talk about scope. Did you see the size of that thing? That's no moon, it's the giant mechanical city of London! Here's a we detail - the time on the clock is nearly midday - it really should be afternoon to reflect the famous opening line of the novel. “It was a dark, blustery afternoon in spring, and the city of London was chasing a small mining town across the dried-out bed of the old North Sea." The town being just is called Salthook and it looks zippy and cool! We also see Hester Shaw. So Christian and Peter didn't have the balls to stay true to the character. We get that, being Hollywood and all. We wonder what her psyche will be like then? Pretty sure that's Anna Fang actress Jihae singing too! * The truth is it's Star Wars but who are we to argue with such greatness? A wee grizzle, Peter Jackson announced the trailer would debut with Star Wars - it did not which meant keen fans were quite disappointed when they went to The Last Jedi and got the Black Panther trailer ... (it was quite good but still...). While Peter was technically correct with his words, perhaps a date would have avoided any confusion and disappointment. Also, Mortal Engines is nothing like Mad Max! What is the Traction Codex? 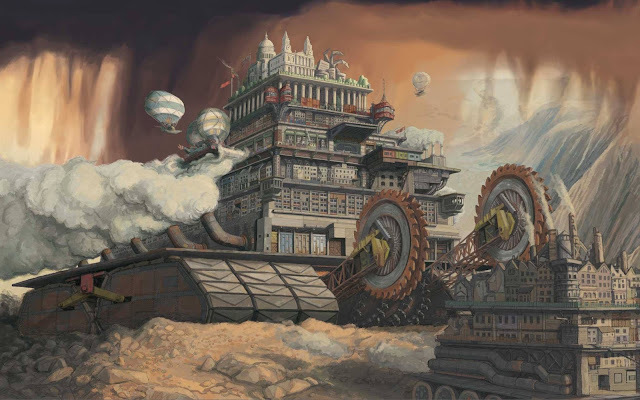 You might have discovered that Philip Reeve's The Traction Codex is getting a re-release in 2018, quite handily timed with the first Mortal Engines movie, it will be formally known as An Illustrated Guide to the World of Mortal Engines. Hello! Sorry, it's barely available *inside* the UK at present. But there will be a new, expanded, print edition next year. But, what is The Traction Codex? "It’s a sort of encyclopaedia/history of the World of Mortal Engines, featuring all those things you Always Wanted To Know But Could Never Be Bothered To Ask, like, how did Airhaven get airborne? Why do the cities use heavier-than-air fighters while the Green Storm stick to airships? Who was Red Loki? etc, etc. 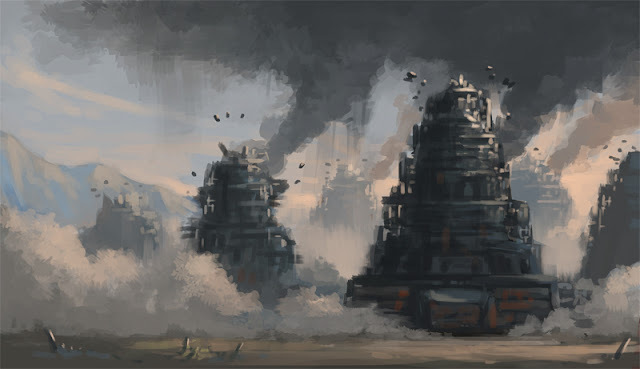 We’ve also added some details which never made it into the books, like the alarming sport of ‘Traktionturnieren‘ or civic jousting…"
Jeremy Levett, has confirmed to us via Twitter that he has again collaborated with Reeve on the new expanded release called the Illustrated World of Mortal Engines. He said "It's much bigger, longer, more comprehensive and has been enormous fun to write. Especially the Australian cities..." I hope there's a Shrimp on the Barbie joke somewhere... >> Levett did a Reddit AMA about his work with Reeve. If you want to have a peek at The Traction Codex right now, go and grab your battered copy of Infernal Devices or any of the others. At the end are a few sample subjects which reveal traction city use of Bumper Stickers that say things like "How's our Hunting", the prior mentioned sport of Traktionturnieren and a handy explanation of the origins of the concept of Municipal Darwinism. 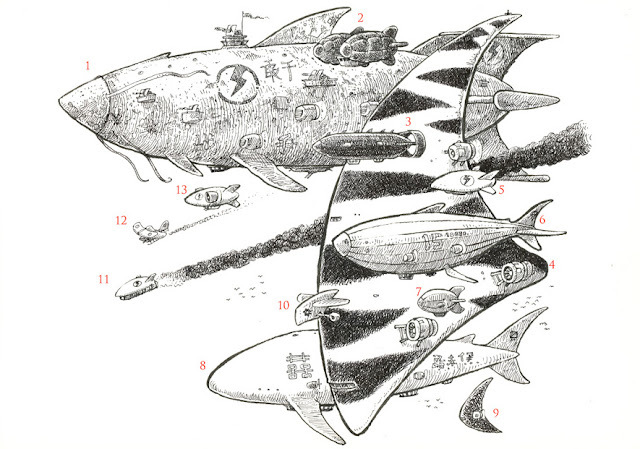 The airships in the top picture above are Reeve's thoughts as to what they might look like. Match the number below to the number on each ship. What do you think of the Jenny Hanniver? 11. Experimental rocket-assisted Zhang Chen Hawkmoth Mk VI, firing its boosters on an attack run. 12. Heavier-than-air fighter, as used by the freelance air-forces of the Traction War. We've learned that Menik Gooneratne is playing the character of Sathya in the Christian Rivers director Mortal Engines movie. Sathya is a friend of Anna Fang's. 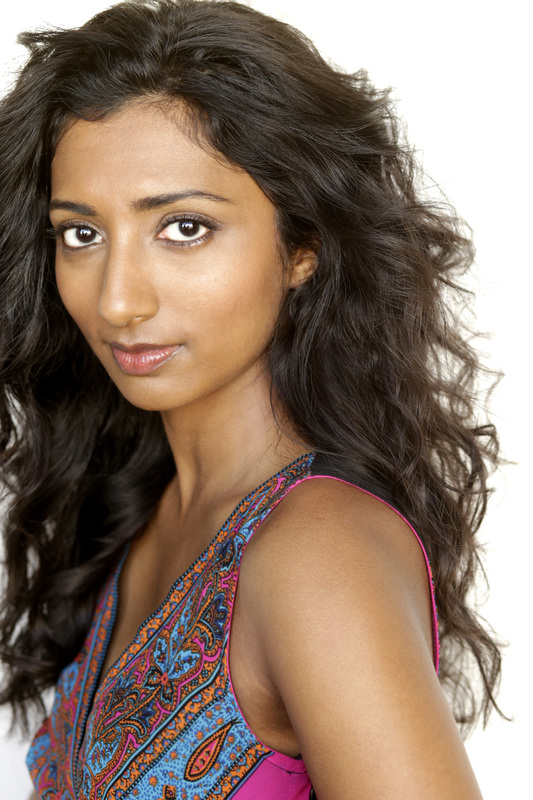 Gooneratne last appeared on the silver screen in the well received Dev Patel film, Lion. A Mortal Engines teaser trailer is on its way. SOON. Like The Last Jedi SOON. Update: Peter Jackson has confirmed the news. An eagle eyed fan has discovered that Canada's Consumer Protection BC unit has approved the release of a Mortal Engines movie teaser trailer. This is a surprise to be sure, but a welcome one. Consumer Protection BC is a Canadian government entity and a key role is "Classifying all motion pictures exhibited in BC". If you're a true blue Star Wars fan you will know two things right now. You will have noted the Star Wars quote above from Emperor Palpatine and you'll also know that The Last Jedi is released in less that two weeks! We're thus of a firm view that the Mortal Engines teaser will be shown during screenings of The Last Jedi. Which kind of makes sense - Universal Pictures will be going in large on this Peter Jackson produced movie so a great way to get the hype train going as fast as a railhead can go is to get in in front of as many people as possible and the new Star Wars movie will serve that need! Approved means approval to release to the Canadian public so we can reasonably expect that similar arrangements are happening across the globe.